Our youth have been known to do wild and crazy things. Zany really, not dangerous or concerning, more out of the box and unexpected. One year, we were robbed of our Christmas caroling plans by a massive snow storm. We were bummed, but we found solace in hot cocoa, popcorn, and Christmas movies. Fast forward to Easter. We’re still bummed. Enter one of my finest ideas ever – Easter caroling! Not just any Easter caroling… Easter caroling at fast food restaurants to cashiers with Easter baskets of encouragement. Ta-da! We were so jazzed. We practiced our Easter ditty, “Up, Up, Up, He Arose” four Sundays in a row, gathered our Easter goodies to share, and invited all our outgoing friends. We organized restaurant stops progressive dinner style and brought dollar bills to take full advantage of the value menus. McDonald’s was our first stop for side salads. We walked up to the cashier to order, asked if we could sing her a carol (no need to freak anyone out), sang her our tune, and offered up an Easter basket of Gospel and chocolate fun, sharing our thanks for her willingness to just be herself and taking our order. The look on that woman’s face I will never forget. There were actual tears in her eyes. It was like Bob Barker and Drew Carey had called her down for the showcase showdown. We are not freakishly generous people. We aren’t special messengers from God. We entered a McDonald’s and gave a gift. We did the same a Wendy’s and Taco Bell, and DQ and got many of the same responses. People are surprised by even remote generosity. I think the idea of generosity almost makes us nervous in our current cultural context. What do people want from me in return? What will they expect from me? It brings up all our “I’m not worthy” instincts. But we have a generous Father. He loved us first, He loves us more. Generosity is a huge part of the message of the Gospel of Jesus Christ. And what this generosity does may surprise us. Look at James 1:17 again and underline each instance of the word “every” in your Bible. Not some, not a few, but so many gifts…”every” says something. It says that God is generous of Himself. You’ll hear James talk again and again, throughout the book, about how we respond to this in the Spirit. “Every” wells up in us and pours out to the world who could do with some “every”, because they’re so used to scarcely. Now read on to James 1:19-27. My choice of this passage in illustrating generosity may surprise you, but bear with me. God generously shows us who we are in the mirror. He shows us both our sinfulness and our salvation. He shows us our beauty as His creation and the mark of the cross eternally etched in our forehead. God’s generosity isn’t limited to love. 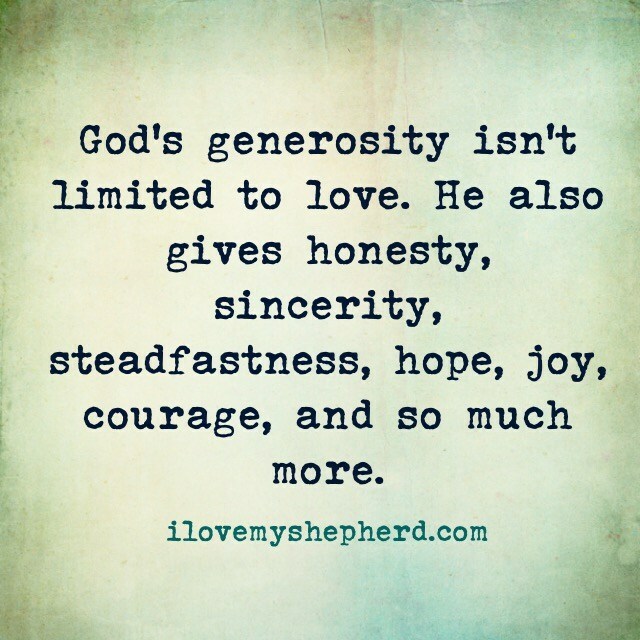 He also gives honesty, sincerity, steadfastness, hope, joy, courage, and more…generously. He generously gives us purpose, rather than a void. We hear the Word and then He generously gives us work to complete, vocations to fulfill, grace to be shared. What kind of generosity is God pouring in you today? How might that reach out to others around you for His Kingdom? Maybe it’s generosity of affection, generosity or discernment, generosity of care or kindness, or generosity of time. Let Him work in you. The implanted Word has saved you. Now let it reach out to every single person you meet, whether it’s your family and friends, or a cashier at the store. They just might be the person who needs to see His generosity the most today. What kind of generosity are you most aware of God giving you in this season of your life? Who is someone you feel called to share a touch more generosity with today? Create your own post-it note truth of God’s generosity to place somewhere you can see today and/share the message of the meme below on social media or anywhere. What does this mean is no empty question and this list is also not accidental, I am sure. Anyone who has had to memorize this segment in their younger years can attest, most of the explanations are short by comparison. Maslow’s hierarchy of needs has nothing on Luther. Every single thing listed above and all the things left unlisted are gifts from God, what we call provision. He causes the sun to rise and set, our heart to beat, and gives the oxygen for our lungs. Without Him, we have nothing. Wow…we get paid for this. So often in church work land we can lose site of the basic miracle that churches come together, by the grace of God. They pool funds, they build buildings, they create children’s programs, and they make ministry happen. They pay for pastors, for teachers, for those they entrust to share the Gospel intentionally, everyday. Do not lose the remarkable of this in the day to day of ministry. Churches, and the struggles you find there, have always existed throughout time, since that first Pentecost. That alone is a beautiful testament to God’s provision. In our culture, God takes it one step further. Some of us do this full-time. Some of us are worker priests or “part-time” church workers. While others of us are trying to figure out what “time” we are and what a fair wage is for that time. God is working in and through all of it with His daily bread and faithfulness. Thank you Lord, for every little thing, every big thing, and every small miracle. Thank you for faithful people and your provision in Faithfulness when we are not. Thank you, Lord, for churches and paychecks, and tents to build and all of your goodness in plenty and in want. You, Lord, You are sufficient. Join us in proclaiming God’s provision in our lives in the #dailybread challenge. For 2 weeks, add #dailybread in social media posts of people in your lives, places you go, and things you enjoy- recognizing every single thing in our lives comes from God. Now there’s a concept most church work families can wrap our heads around. Not because we love racking it up, but it has been or is a reality in our lives. We write the check each month to the holder of gross amounts of student loans, we still pay for a car we have to fix regularly, or we hope that the cash on hand will cover the grocery bill for the week. Or maybe you are out of this stage and thankful to be in debt to no one any longer. How freeing it is! Finances are often a contentious issue, individually, in a marriage, and in congregations. So this language in Romans makes sense to us. Debtors we do not want to be. Debt is a shackle, a weight, the opposite of freedom. So let us live for one who freed us for the very sake of our freedom. (Galatians 5:1) Christ paid our debts on the cross in full. Every sin, every evil thought, every single thing that separated us from God- gone. Paid in full. Can you breath in and feel the weight lift just thinking of it? And so we hold no debt either. We are released of the burden. So things in this earthly life need not weigh us down either. This is easily said, but financial burden is real, emotional turmoil is real, medical bills and health concerns are real. What is also real is that we need not “live” according to them. It is easy for these burdens and worries to begin to rule our lives. Anxiety overtakes us, we make enemies of our spouse in an argument because the weight of it is overwhelming, we live in fear of the next thing that will empty the little we have in our savings. This is living according to the flesh, this is a challenge for most of us in the sanctified life. Praise God! Just as He has justified us from all sin. He has freed us from every burden. Just as we are His, He then rules everyone in our homes, every thing in our lives, every dollar in our wallet. We live and lay it at the cross. We experience restoration in our trouble through His Word and at His table. Thank you, Lord for providing for my family. Thank you for bearing every burden. I lay my burdens before you now, knowing you have already lifted them on the cross. This life I live in the Spirit. In Jesus Name. Amen.